Bei einem Flugunfall auf der US-Luftwaffenbasis Sheppard in Texas ist am Dienstag ein Fluglehrer der Bundeswehr leicht verletzt worden. Der Flugschüler, ein US-Soldat, erlitt ebenfalls Verletzungen. Als die Trainingsmaschine vom Typ T-38 Talon von der Startbahn abkam, hätten sich der deutsche Fluglehrer und sein Flugschüler mit dem Schleudersitz aus dem Flugzeug geschossen, teilte die Luftwaffe mit. Die Ursache des Unfalls ist noch unklar. Auf der US-Basis findet die Ausbildung für die Jetpiloten europäischer NATO-Staaten statt, das so genannte Euro-NATO Joint Jet Pilot Training Program (ENJJPT). Für angehende Bundeswehrpiloten gehört dieses Training zur üblichen Ausbildung. Nach Angaben der Airbase wurden die Verletzungen des Fluglehrers, Major Christian Hartmann, im örtlichen Krankenhaus behandelt. Sein Flugschüler, ein Leutnant der U.S. Air Force, wurde zur Beobachtung in eine größere regionale Klinik eingeliefert, sei aber in stabilem Zustand. 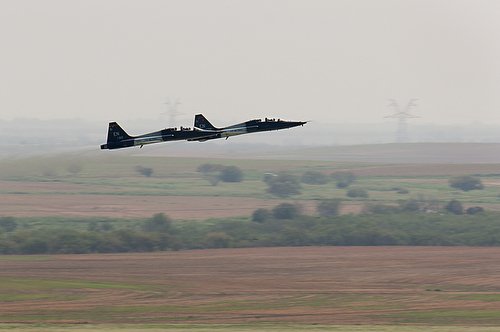 A T-38C Talon aircraft assigned to the 80th Flying Training Wing departed the runway prior to takeoff this morning at about 10:13 a.m. here today. Both pilots ejected. German Air Force pilot Maj. Christian C. Hartmann was treated for minor injuries at the Sheppard Clinic. U.S. Air Force pilot 1st Lt. Charles T. Walet was taken to United Regional Medical Center in Wichita Falls as a precaution, and is reported to be in stable condition. Walet is assigned to Vance AFB, Okla., and was on temporary duty to Sheppard. „We are grateful both aircrew members are safe, and for the outstanding response from our fire, security and medical personnel. We also greatly appreciate the any expressions of support from leaders and members in our local community,“ said Col. Lendy Renegar, 80th Flying Training Wing vice commander. „We’re relieved both pilots successfully ejected the aircraft and stand ready to assist Sheppard in any way we can,“ said Col. Corey Simmons, commander of the 71st Flying Training Wing at Vance AFB. The 80th Flying Training Wing operates the Euro-NATO Joint Jet Pilot Training Program, which trains combat pilots for 14 partner nations, which include Germany, Belgium, Canada, Denmark, Greece, Italy, The Netherlands, Norway, Portugal, Romania, Spain, Turkey, the United Kingdom and the United States. Sheppard’s T-38 fleet completed a $185 million upgrade to the new MK US 16T ejection seats in 2013. The „zero/zero“ seats allow the aircrew to eject from zero feet altitude at zero velocity. Emergency crews responded to the scene immediately to provide medical support to the aircrew and also extinguished a small fire in and around the aircraft. An explosive ordnance disposal team from Fort Sill also responded as a precaution, to ensure all the explosive material associated with the ejection seats was safely expended. The scene was declared safe for recovery operations at about 12:45 p.m.
An investigation is underway; the Air Force will not speculate on possible causes until the investigation is complete. Die Nationalität des Flugschülers teilte die Luftwaffe nicht mit, damit dürfte es sich nicht um einen Deutschen handeln. Ich habe das oben im Text korrigiert und bitte den Fehler zu entschuldigen.